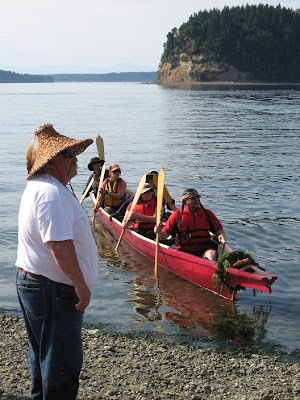 Image Above: Carver Camp/Steilacoom Tribe Canoe Family land at first stop on the 2009 Tribal Journey southern route at Solo Point south of Steilacoom. From front to back: Steilacoom Tribal Leader Danny Marshall, Danny's daughter Lacie Marshall-Deck, Carver Enrique Leon, Carver Sarah Storm, Skipper Merrie Gough. 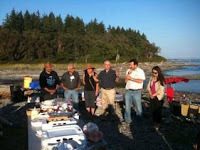 On shore, Steilacoom Tribal Council Member Ken Dittbenner. 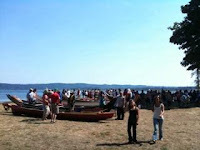 I had the great honor or paddling with Phil Red Eagle's Carver Camp/Steilacoom Tribe Canoe Family again this year for the annual Tribal Journey. 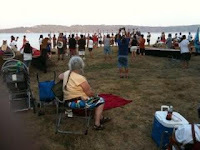 This year's host Tribe was Suquamish. We paddled on some of the hottest days of the year and had some pretty long distances as well with one leg being 26 miles. The whole Journey was incredibly inspiring with the wonderful people, ceremonies, and visits to the many Tribal homelands. There were a few highlights too. 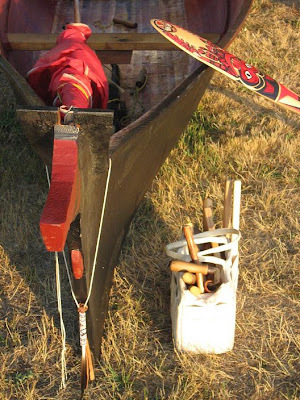 The first major highlight of this year's Journey for me was that performer Pura Fe was traveling with one of the Canoe Families that also launched from Steilacoom. I've been to several live performances by Pura Fe so it was wonderful to have her great energy and spirit along with us all on the Journey. I actually ran into Pura Fe and her friend at Fred Meyer in Ballard the night before the Journey when I happened to hear her voice in the next isle. Then we discovered we were both going on the Journey. And...when I arrived to Steilacoom for our launch it turned out that the Canoe Family she was traveling with was also launching from Steilacoom. Another highlight was the many village naming ceremonies conducted at by Delbert Miller, Cultural Resources Director of the Skokomish Tribe. 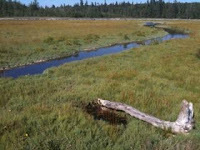 Yet another highlight was a visit to the Suquamish Tribal Reserve, a sacred beachfront and wetland not to far from the final destination. The Reserve was beautiful and one evening we were visited by Larry Echohawk, Asst. Secretary for Indian Affairs in the Obama Administration, a very great honor (and he's related to a good friend from Policy Grad school, Abigail Echohawk). I actually got to walk alone with him on the beach for about five minutes and chat policy. 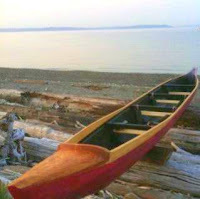 Canoe Journey, Sacred Reserve, and beach chat with Larry Echohawk...strong Medicine for me and pretty awesome graduation gift from the Great Spirit I'd say. 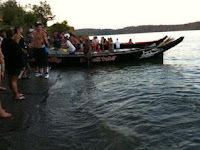 Another memory of this year's journey will be the Tribe's incredible efforts to green the event. They did a fantastic job and many people will talk about how their efforts set a new standard for the Tribal Journeys for many years. 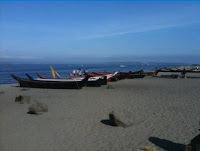 Finally, it was really great to land and launch on my home beach, Golden Gardens in Ballard. 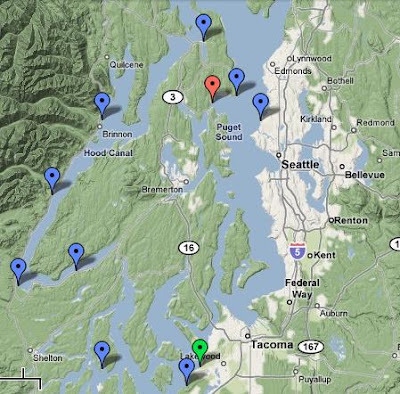 2009 Southern Journey Route: Launch in Steilacoom (green marker), landing in Suquamish (red marker). This year I kept everyone up-to-date through my iphone app, Loopt. 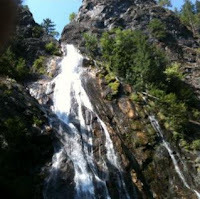 Below are the iPhone photos from the journey. many, Many, MANY thank yous to the many paddlers, support crew, and hosts who made this year's Journey so wonderful.